This one’s mostly a housekeeping post, to keep you abreast of some notable developments with SV-POW!sketeers and friends. Added April 29 – I’m such a tool, forgot to mention that another awesomely niche-y blog has been unleashed on the paleo-blogosphere: March of the Fossil Penguins, by our friend and sometime sauropod-describer Dan Ksepka. Go waggle your hydrodynamic forelimbs at him, I’m sure he’ll be happy to regurgitate some tasty posts for you. I’m tired of paying for sauroposeidon.net so I’m letting it lapse at the end of this week. I’ve already migrated my CV and papers to a new site, where they will hopefully remain forever. As previously noted, The Marsh Repository also has a new home. Ask A Biologist is back! Go make yourselves useful/satisfy your curiosity. Don’t forget to thank your friendly local Dave Hone. Mike’s new blog, The Reinvigorated Programmer, is all of two months old and has already passed SV-POW! in total hits. So don’t give him any more link traffic. Instead, tell your friends how wonderful SV-POW! is! After two and a half years of weekly posts, we’ve decided to stop being so slavish about our titular obligation and will henceforth blog as frequently or infrequently as we please. We’re keeping the title, though. If you’re offended by that, you can backronym SV-POW! as Sauropod Vertebra Picture of the Whenever. Similarly, we’re going to start posting about sauropod skulls and appendicular bits from time to time. Not that we haven’t been doing that anyway–heck, even wallaby toes are not safe from our roving curiosity–but we’re going to stop marking such posts off-topic and putting in obligatory sauropod vert photos. Don’t worry, though, we’ll still be mostly sauropod vertebrae, most of the time. 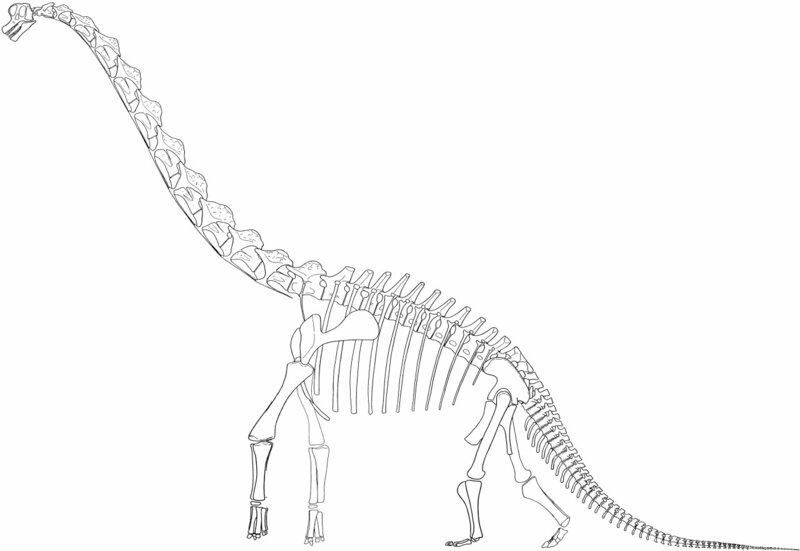 And speaking of, here’s something lovely: a cervical of Rapetosaurus, from Curry Rogers (2009:fig. 5). Cool fossae, eh? Also, check out how dinky the centrum is compared to the neural arch. Here at SV-POW! Towers, we have often lamented that so much dinosaur research is locked up behind the paywalls of big for-profit commercial publishers, and that even work that’s been funded by public money is often not available to the public. One of the quiet delights of the last couple of years has been watching the hide-research-from-researchers edifice slowly crumbling, and indeed we have a whole section of the site dedicated to that very thing: the Shiny Digital Future. The process is slow, which should surprise nobody given that large, powerful, profit-motivated corporations are trying to prevent it, but it does feel increasingly inevitable. This week has brought two more steps towards the open-access utopia: one of them specific and immediate, the other more long term but potentially much more far-reaching. In the immediate, the New Mexico Museum of Natural History has made all issues of its Bulletin up to 2008 freely available. Although the quality of the articles in these issues is hugely variable, there is a lot of good and important stuff in there, and it’s a boon to the community that they are now open to anyone who wants to read them. I just heard today about the Federal Research Public Access Act (HR 5037), brought before Congress six days ago by a bipartisan group of six representatives (four Democrats and two Republicans). If passed it would ensure that all research funded by eleven U.S. federal agencies was made open-access. If you’re American, follow the link to see what you do to help ensure that it’s passed! As Galadriel said, the world is changing. 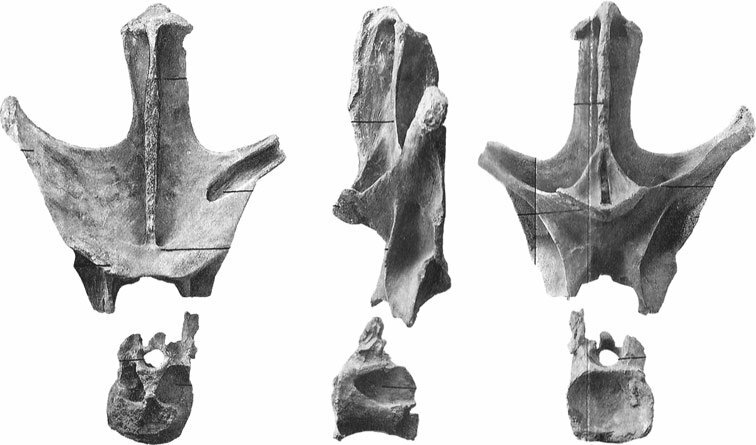 Holotype dorsal vertebra of Nopcsaspondylus, apparently, from Mannion (2010:fig. 5), although it bears little resemblance to Apesteguia (2007:fig. 2) which is the illustration of that element in the paper that named the genus. Mannion's figure seems to be reproduced from Nopcsa (1902), which I really ought to get hold of so I can check this for myself. Ever notice how Haplocanthosaurusy rebbachisaurid dorsals look? Just sayin', is all. Finally: I know that whenever we talk about proprietary publishers, I always tell people to go and read Scott Aaronson’s essay on the subject, but seriously: if you’ve not read it before, go and read it now. It’s brilliant. Thanks to Phil for the clarification below on whether the pictured vertebra is or is not the Nopcsaspondylus holotype (it is). Phil also sent me a scan of Nopcsa’s original figure of this plate, which is rather better than the reduced version that made it into the new paper, so here it is! 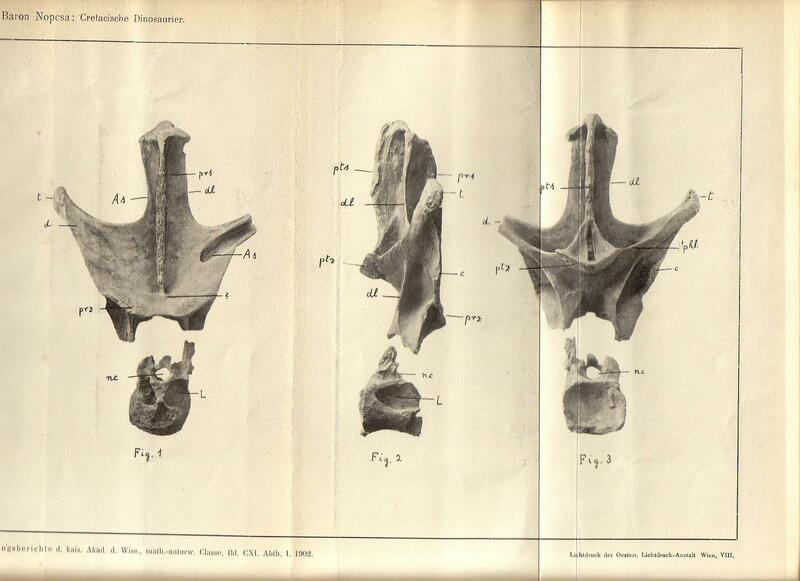 Definitely the holotype dorsal vertebra of Nopcsasopondylus, from Nopcsa (1902). Still looking kind of Haplocanthosaurusy. The main differences apparent here seem to be that this vertebra has a more vertically compressed centrum and more medially directed SPOLs than the Haplo dorsals. Still, I find myself wondering how many steps it would take to move Haplo into a basal rebbachisaurid position. Funny, really, Rebbachisauridae is just about the only sauropod clade that it hasn't been referred to. 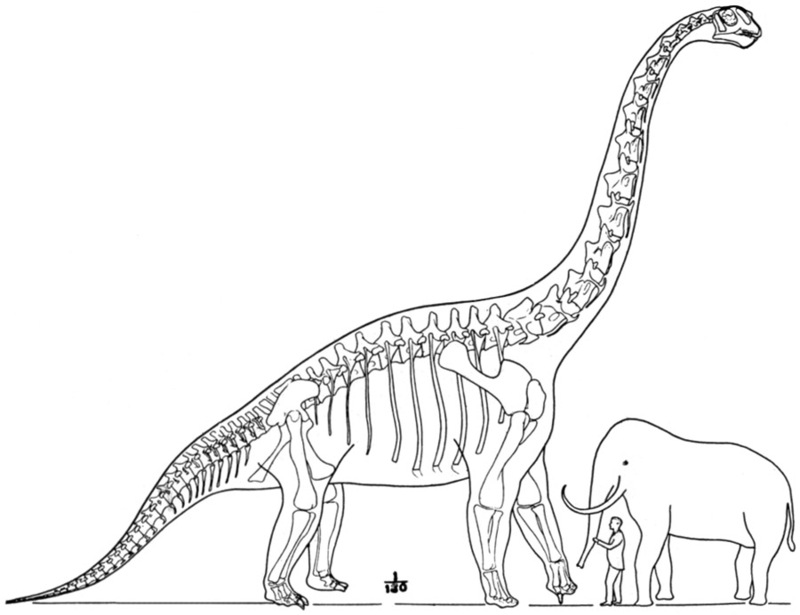 Argentinosaurus: smaller than you think? 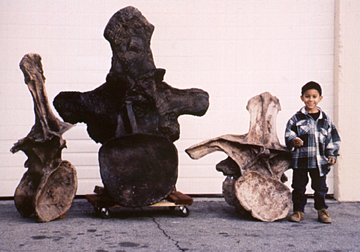 Dorsal vertebrae from Argentinosaurus (center) and Supersaurus (either side). The vert on the left is the holotype of Ultrasauros, and the one on the right is the holotype of Dystylosaurus, but both of those taxa have been sunk into Supersaurus. Found on teh intert00bz. As often happens here, a comment thread got to be more interesting than the original post and ended up deserving a post of its own. In this case, I’m talking about the thread following the recent Mamenchisaurus tail club post, which got into some interesting territory regarding mass estimates for the largest sauropods. This post was inspired by a couple of comments in particular. I don’t trust Mazzetta et al.’s (2004) estimate, because it is based off of logarithmic-based regression analyses of certain bone lengths, which a recent paper by Packard et al. (2009) have shown to overestimate the mass by as much as 100 percent! This would mean the estimate of 73 tonnes given my Mazzetta would be reduced to 36 tonnes. Zach, Mazzetta et al. used a variety of different techniques in arriving at their Argentinosaurus mass estimate, cross-checked them against each other and tested their lines for quality of fit. I am not saying their work is perfect (whose is?) but I would certainly not write it off as readily as you seem to have. Weeeeell…Mazzetta et al. did use a variety of measurements to make their mass estimates, but they did it in a way that hardly puts them above criticism. First, their estimates are based on limb-bone allometry, which is known to have fairly low accuracy and precision (like, often off by a factor of 2, as Zach noted in his comment). Second, the “raw data” for their allometric equation consists of volumetric mass estimates. So their primary estimation method was calibrated against…more estimates. Maybe I’m just lazy, but I would have skipped the second step and just used volumetric methods throughout. Still, I can see the logic in it for critters like Argentinosaurus where we have limb bones but no real idea of the overall form or proportions of the entire animal. Anyway, the accuracy of their allometric estimates is intertwingled with their volumetric results, so if their volumetric estimates are off…. The volumetric estimates used a specific gravity of 0.95, which to me is unrealistically high. Taking into account the skeletal pneumaticity alone would lower that to 0.85 or 0.8, and if the critter had air sacs comparable to those of birds, 0.75 or even 0.7 is not beyond the bounds of possibility (as discussed here and also covered by Zach in his comment). The values from Christiansen (1997) were recalculated using a slightly higher overall density (950 kg/m^3), as the 900 kg/m^3 used in that paper may be slightly too low. Most neosauropods have extensively pneumatised vertebrae, particularly the cervicals, which would tend to lower overall density. However, these animals are also very large, implying a proportionally greater amount of skeletal tissue (Christiansen, 2002), particularly appendicular skeletal tissue, and consequently, they should have had a higher overall density. This is pretty interesting: they are arguing that the positive allometry of skeletal mass as a fraction of body mass–which is well documented in extant critters–would offset the mass reduction from pneumaticity in animals as big as sauropods. I haven’t given that enough thought, and I definitely need to. My guess–and it is a guess–is that the effects of skeletal allometry were not enough to undo the lightening imposed by both PSP (~10%) and pulmonary air sacs (another ~10%, separate from the lungs), but I haven’t done any math on this yet. Fodder for another post, I reckon. Getting back to Mazzetta et al., some of the volumes themselves strike me as too high, like ~41,500 liters for HM SII. That’s a LOT more voluminous than Greg Paul, Don Henderson, or Mike found for the same critter. 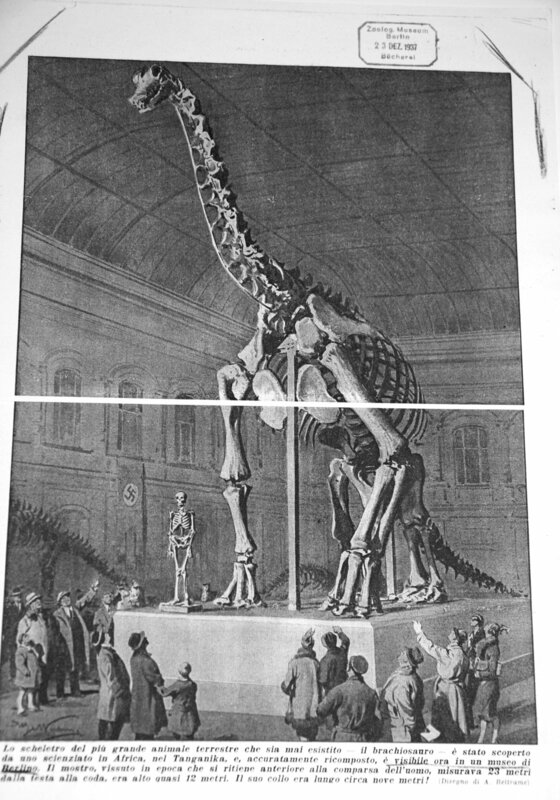 The 16 metric ton Diplodocus and 20.6 metric ton Apatosaurus used by Mazzetta et al. are also outside the bounds of other recent and careful estimates. Not necessarily wrong, but definitely at the upper end of the current spectrum. None of this means that Mazzetta et al. (2004) were sloppy or that their estimate is wrong. Indeed, one of the reasons that we can have such a deep discussion of these points is that every link in their chain is so well documented. And there is room for honest disagreement in areas where the fossils don’t constrain things as much as we’d like. You cannot simply take a skeleton, even a complete one, and get a single whole-body volume. The body masses of wild animals often fluctuate by a third over the course of a single year, which pretty well buries any hope of getting precise estimates based on skeletons alone. And no one knows how dense–or sparse–sauropods were. I haven’t actually done any math to gauge the competing effects of skeletal allometry on one hand and PSP and air sacs on the other–and, AFAIK, no one else has either (Mazzetta et al. were guessing about pneumaticity as much as I’m guessing about skeletal allometry). Finally, Argentinosaurus is known from a handful of vertebrae and a handful of limb bones and that’s all, at least for now. If we can’t get a single body volume even when we have a complete skeleton, we have to get real about how precise we can be in cases where we have far less material. Mazzetta, G.V., Christiansen, P., and Farina, R.A. 2004. Giants and bizarres: body size of some southern South American Cretaceous dinosaurs. Historical Biology 2004:1-13. This is pretty impressive work, especially given that it was published one year after Janensch’s (1914) preliminary short paper on the Tendaguru Formation’s fossils. Since that initial report did not figure the scapula Sa 9, it’s tempting to imagine that Matthew or his artist must have visited Berlin and seen the material in person; but as this was in the middle of World War I, that seems unlikely. Does anyone know the story here? Infuriatingly, Young does not say anything whatsoever about the provenance of this restoration — for all I know, it might have been done in 1974 by a talentless artist who ignored the previous sixty years’ work. But it seems more likely that it’s very early work, and therefore of great historical importance. Once more (and believe me, I am getting embarrassed at how often I’ve said this), I welcome any further information. Many of you will have used PDFs downloaded from the O. C. Marsh archive at http://sauroposeidon.net/marsh.html. That address will become inoperative at the end of this month, and the archive is now hosted at http://marsh.dinodb.com/ — Please update your bookmarks, links, etc. Janensch, Werner. 1938. 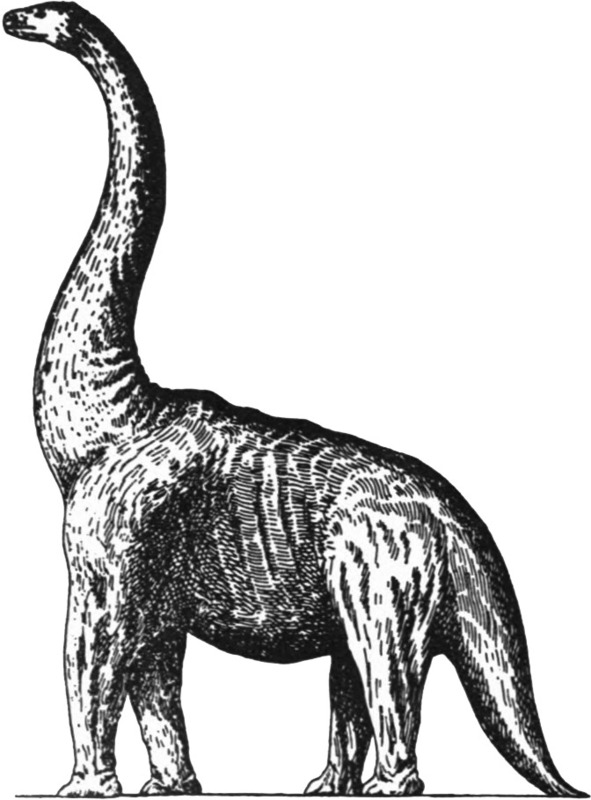 Gestalt und Grösse von Brachiosaurus und anderen riesenwüchsigen Sauropoden. Biologe 7: 130-134, 2 figs. Janensch, Werner. 1950b. 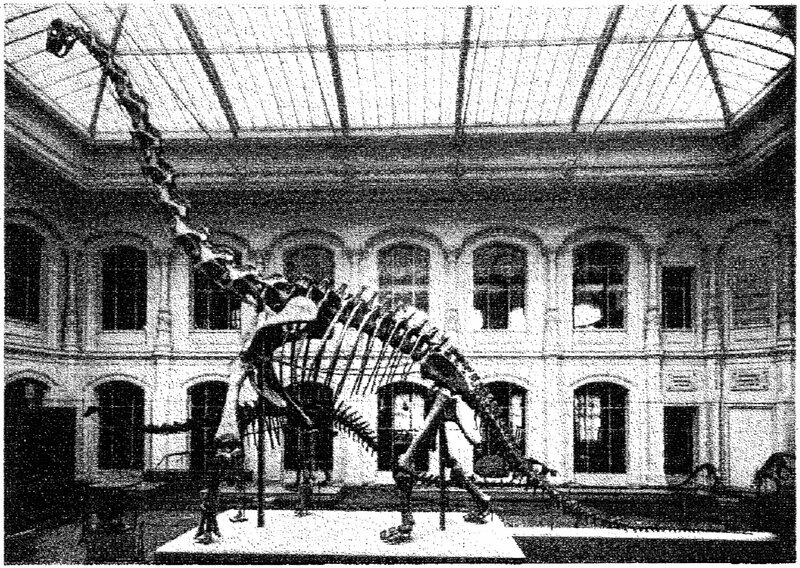 Die Skelettrekonstruktion von Brachiosaurus brancai. Palaeontographica (Suppl. 7) 3: 97-103. Matthew, W. D. 1915. Dinosaurs, with special reference to the American Museum collections. American Museum of Natural History, New York. 164 pages. Young, D. 1975. Brachiosaurus, the biggest dinosaur of them all. Field Museum of Natural History Bulletin 46(1):3-9. 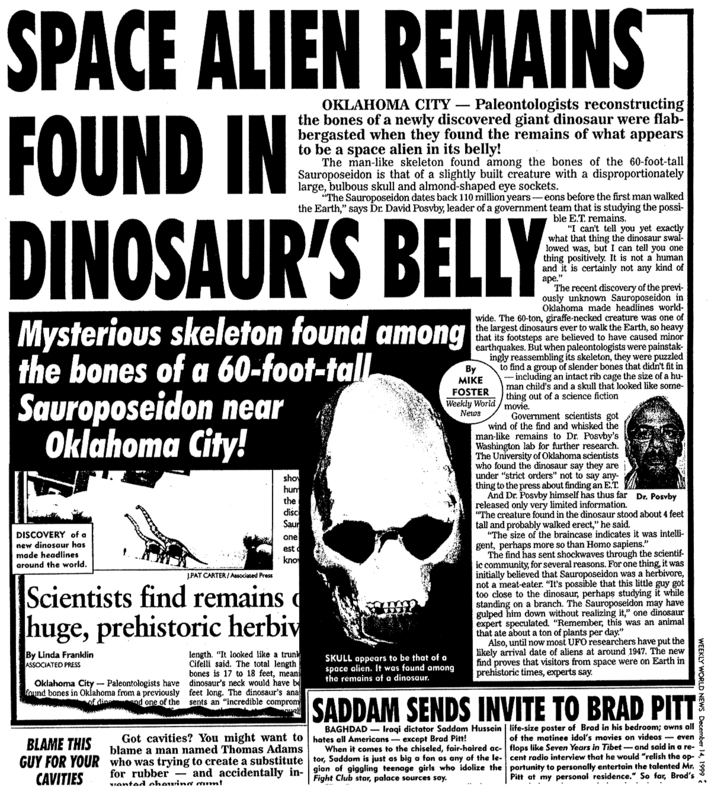 This is an actual page from the late, lamented Weekly World News, from December 14, 1999. I always thought it was pretty darned funny that they had the alien remains discovered in the “belly” of an animal known only from neck vertebrae. Now, subjecting a tabloid story to technical scrutiny really is like dancing about architecture, but…it just tickles me. As does the entire story. I haven’t been able to get hold of Dr. Posvby to confirm his findings, but it’s been over a decade and he still hasn’t published, so I’m not holding my breath. Incidentally, the WWN archives are available on Google Books: go here to read about Bat Boy siring a 3-headed alien Elvis baby on a female Sasquatch. Or something to that effect.